Located in the Languedoc-Roussillon region of France, in the department of Pyrenees-Orientales, the mountains of the Eastern Pyrenees form a natural border between France and Spain. Situated 45 minutes west of Perpignan in the foothills of the Pyrénées, Vernet Les Bains is an ancient spa village with a wide range of facilities making it a wonderful location to holiday or take a short break. 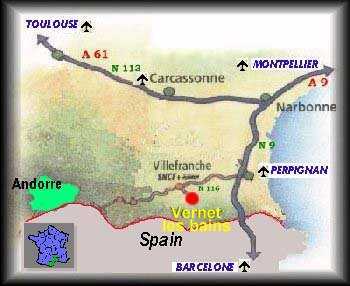 Vernet Les Bains is approximately 45 mins from Perpignan with daily low-cost flights from RyanAir amongst others. The Spanish border is about 40 mins away. Other easily accessible airports serviced by low-cost carriers are Barcelona-Girona (1hr 40mins); Barcelona (2 hrs 40mins); Carcassone (2 hrs);Toulouse (2 hrs 40mins); Montpellier (2 hrs 40mins); Nîmes (3 hrs). There are also daily flights to Perpignan from Paris (Orly). Rental Notes: EUROS also accepted - please enquire for a price. Prices quoted are per week. A phone call or email will secure a provisional booking which may be held for up to 5 days. A 25% deposit is required upon booking, the balance and security deposit is due 8 weeks prior to start of rental. Rental includes: water, electricity, linen and changeover cleaning.